Mrs. Graf shows how she uses student response systems to collect and document evidence of learning. I can add, subtract, factor and expand linear expressions with rational coefficients in order to identify and write equivalent expressions. I can rewrite an expression in different forms to show how the quantities are related. I can combine like terms and use the distributive property to simplify expressions. I can identify, analyze and write equivalent expressions. CCSS.MATH.CONTENT.7.EE.A.1 Apply properties of operations as strategies to add, subtract, factor, and expand linear expressions with rational coefficients. CCSS.MATH.CONTENT.7.EE.A.2 Understand that rewriting an expression in different forms in a problem context can shed light on the problem and how the quantities in it are related. For example, a + 0.05a = 1.05a means that "increase by 5%" is the same as "multiply by 1.05." How did Mrs. Graf’s use of technology enhance student learning? How did Mrs. Graf plan ahead to gather and use accurate information about student learning? 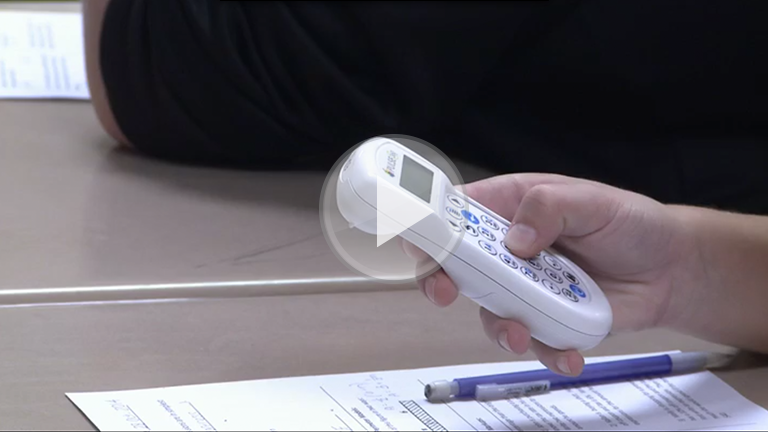 How did Mrs. Graf incorporate technology as a formative assessment tool? Why do you think that Mrs. Graf did not grade the students on the evidence collected in this video? How do you currently gather “just-in-time” evidence of your students’ learning? How do you use technology to gather and respond to evidence of student learning? What will you do to enhance your use of technology to promote student learning? How will you plan ahead to efficiently collect and respond to “just-in-time” evidence of learning? Enroll in the Student Ownership module. Enroll in a FIP in Action module for middle school math.